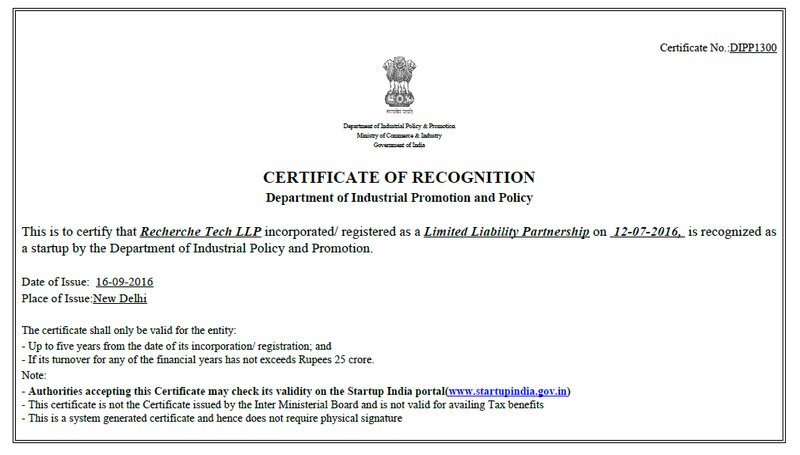 On 16th September, 2016, Recherche Tech LLP was conferred the Startup India Recognition by the Department of Industrial Promotion and Policy, Govt. of India. This is in acknowledgement of the innovation of our product, My sCool Server – The next generation in computing and learning convenience for schools. This was made possible with the support of National Design Business Incubator – An NID, Ahmedabad initiative supported by DST Govt. of India. NDBI verified and endorsed our product’s innovative quotient. We are very grateful to Dr. Vikram Singh Parmar, CEO, NDBI, Ahmedabad, without whose guidance this would not have been possible. This recognition is a huge encouragement for our mission to usher in a socioeconomic revolution by making computer literacy and therefore digital inclusion affordable and achievable across all strata of society. With this boost, Recherche Tech moves ahead on its vision to be the leader in innovative, affordable and inclusive application of open source IT in the educational segment.